Oh [Humberto], what will you think up next? A human Theremin you say, and it’s for Halloween? Certanly this will blow last years creepy capacitance sensing jack-o-lantern out of the water right? Eh, not really, but still cool none-the-less. By using pairs of IR LEDs and IR photo-transistors, [Humberto] makes a simplistic distance sensor. Then its just a matter of converting that light value into sound, which is accomplished by using some very clever PWM square wave hacking to make a triangle wave. Also, [Humberto] goes over the process of using fast integers to represent slow floating point numbers. While none of the project is really a new concept, it certainly is put into an easy perspective so anyone can try their hand at it. All well worth the read, or you can catch a video after the jump. Typo in the title, should be Ther[e]min. I wonder, could he not also use this by moving his own wrists vs a surface? @turn.self.off I was thinking this too, but I wasn’t sure if interference from the IR LED on the other wrist would just ruin the effect. Yes as to playing off of a surface. The sensor for volume need not as be sensitive, as pitch. So interactivity could be low. Keep your hands apart to interact with a table top. 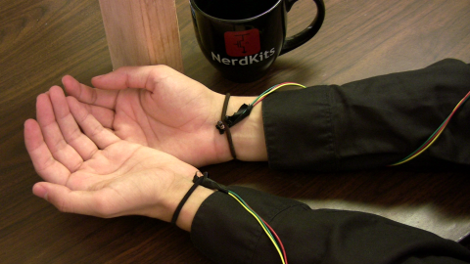 With the recent hack of IR sensors for piano velocity sensing, you could put one on each finger. Silicone and gloves. Scaled down in sensitivity. Control filter parameters in real time speech synthesis like the Voder in the 1939 Worlds Fair.